Apps could soon be joining your game collection in Steam. If you’ve ever used Steam’s platform for purchasing and downloading games — and you probably have if you’re a Mac or PC gamer — then you’ll already be aware of just how great it is. In fact, if there’s one platform that beats the Mac App Store when it comes to buying games, it’s Steam. And that rivalry could be about to get a whole lot greater. After a list of productivity software categories briefly appeared within Steam’s mobile app, it looks like the company could be about to take on Apple’s store by selling apps as well as games. As noted by a reader of The Verge earlier this week, Steam’s mobile app briefly listed a variety of software categories unrelated to gaming, including Accounting, Animation & Modeling, Audio Production, Design & Illustration, Education, Photo Editing, Utilities, Video Production, and more. All of these categories were empty, but they reportedly appeared on all mobile versions of the Steam app — on both Android and iOS — for a short very short period. They did not appear on the desktop or web-based versions of Steam, however. Of course, these categories have sparked speculation that Steam is going to expand its store to sell apps as well as games. The platform is already incredibly popular among gamers, with around 40 million users worldwide, which could provide a huge threat almost overnight to marketplaces like the Mac App Store, and Microsoft’s upcoming Windows store in Windows 8. There could be some huge advantages to this, too. Steam offers software bundles, and frequently holds big sale events that see popular titles slashed by up to 75% — like the ongoing Steam Summer Sale. This is something Apple doesn’t offer with the Mac App Store (although developers can reduce their own prices as and when they choose to), which is disappointing to both consumers and developers. These mystery categories are no guarantee of things to come, of course, so this could simply be a whole lot of speculation over nothing. But there’s no denying that the move could make a whole lot of sense. Steam has kicked off its summer sale, offering up to 75% off some of the hottest games for Mac and PC. The sale runs until July 22, Steam is adding new titles each and every day, with customers given the opportunity to vote for the titles they want to see reduced. This isn’t just an opportunity to sell old games; the sale includes some of the biggest and best titles currently available, including Call of Duty: Modern Warfare 3, Portal 2, Skyrim, and many, many more. You can choose to buy games individually with up to 75% off, or in “pack deals,” which see several titles from one developer bundled together with up to 90% off. The SEGA Hit Collection, for example, features a whopping 71 games, and has now been reduced by 89%. Other greats include the Rockstar Hit Collection, the Valve Complete Pack, and the Activision Hits Collection. Steam is also giving gamers the opportunity to vote for the titles that they’d like to see heavily discounted next. There are three titles to choose from, and these change every eight hours. Macs can be used for serious gaming, mmmkay? Steam, the online computer gaming portal, keeps track of what hardware its players are using to access the many games in its service. Of interest in the exhaustive list of specs is the fact that 49.46 percent of Mac gamers on Steam game on a Macbook Pro. Which makes sense, of course, as that’s a pretty powerful laptop. From there, we see the iMac coming in at 28 percent, plain-jane MacBooks garnering 9.49 percent, and the MacBook Air, my personal machine, used by 6.29 percent of Mac Steam gamers. The MacBook Pro and MacBook Air both rose in the hardware charts, with an increase of .44 and .89 percent, respectively. Another interesting note is that a 58 percent majority of Mac gamers on Steam have 4 Gb of RAM, while a large minority of 28 percent have 5 Gb or more of RAM memory. I’d have thought that it’d have been switched, of course, as RAM does affect the playability of a great many games, though not as much as the RAM in individual video cards does. Speaking of video cards, there’s a long list of them being used in Macs to play Steam games, with (obviously) Intel HD Graphics and the NVIDIA GeForce 9400M topping the list at 17 and almost 12 percent, respectively. Below those two, however, ATI and NVIDIA cards top the charts all the way down, with nary an Intel card on the list until the bottom. What OS are Mac gamers using to blast aliens and solve puzzles? Mainly Lion (10.7.4 at 49 percent) and Snow Leopard (10.6.8 at 31 percent), of course. Apparently, not a lot of folks are playing games if they’re not updated to the latest OS version. Both those numbers are 64 bit versions, as well. Surprised? Not us. The largest number of Mac Steam gamers are using the standard 2 CPUs, as measured by Valve, with only a few outliers using more. Most of the Mac players have a microphone and most speak English, both of which reflect the larger Steam numbers as a whole. Check out the full report on the Steam website, and geek out with us on the Cult of Mac forums or comments below about your own setup and whether you play Steam games on your Mac or not. 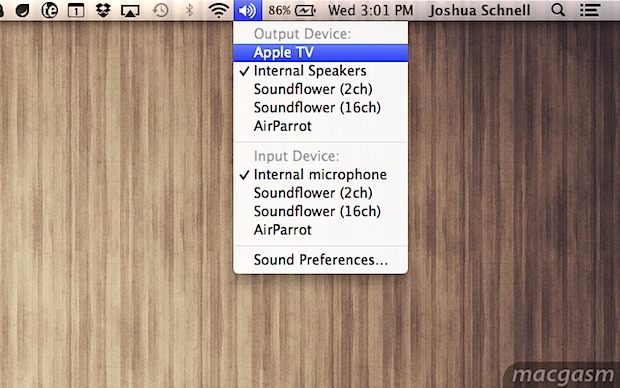 You can now stream a Macs system audio directly over AirPlay without any third party apps or tweaks. The best part is that unlike AirPlay mirroring, the system audio stream should work on any Mac that can run Mountain Lion, not just 2011 model year and newer Macs. Is that easy or what? Now launch Pandora, Spotify, iTunes, DJay, or anything else that has audio, and your Macs sound gets streamed out to the AirPlay receiver. If you’ve been trying to figure out a way to get wireless speakers hooked up to a Mac with little effort, this is it. iOS Games & Apps on sale for Memorial Day! why can i only buy apps in apples app store?